In previous article I wrote how to subscribe to MQTT topics and display also timestamp with color. There was one MQTT topic which represented server load and it demonstrates that MQTT could be used for server monitoring. Cron will invoke the command every minute. Command will publish data to MQTT topic /server/reactor/load (note: reactor is the name of my server). We can subscribe at a workstation to the topic and execute some commands. mosquitto_sub will keep running in the background and we can use xargs to invoke a new command once the new message arrives. The only downside is that notifications are spamming desktop every minute. 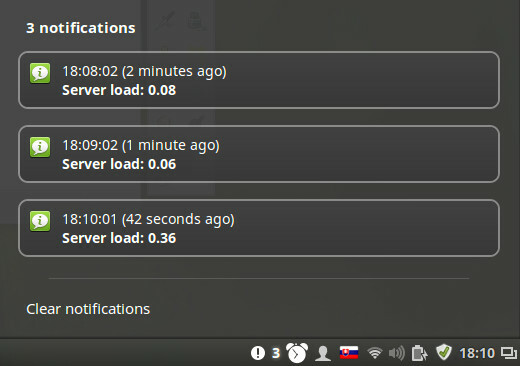 It does not make sense to notify admin when server load is too low. We can add a little bit of logic and display notifications about load which exceeded a certain threshold. Note: just be aware that message from MQTT is not sanitized. Run such command only in trusted environment or add type check of value received from MQTT. 11. February 2017 at 19:29 - IoT (Tags: linux, MQTT, Server). Both comments and pings are currently closed.